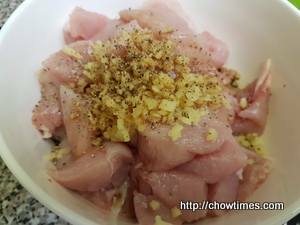 Marinate chicken with ginger, soy sauce and ground black pepper for 10 to 20 minutes. Add the egg and potato starch. 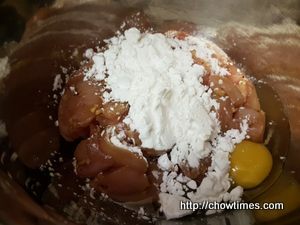 Mix the chicken with a pair of chopsticks or with your hand to coat every piece of chicken evenly. 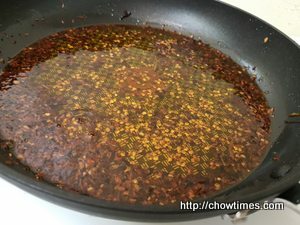 To prepare the spicy garlic and leek infused oil, heat up a frying pan with 1/2 cup vegetable oil. When the oil is heated, lower the heat to medium and add the garlic and leek. 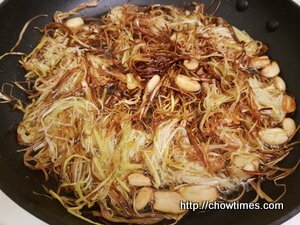 Stir them with a pair of wooden chopsticks until the garlic and leek turn light golden brown and crispy. 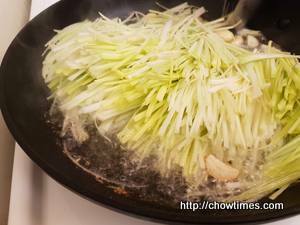 Remove the garlic and leek with chopsticks or tongs and set them aside on a plate. 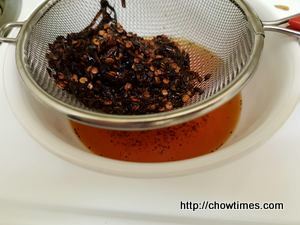 Turn off the heat and add the chili pepper flakes into the hot oil. Stir it and let it cool for a few minutes. Strain the oil for later use. To fry the chicken, heat up 1 cup of vegetable oil in a large frying pan over high heat for 3 to 4 minutes. 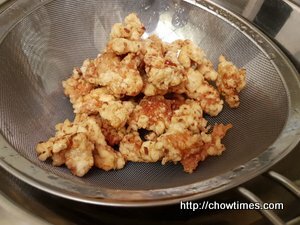 Turn down the heat to medium high and fry the chicken, ensure the chicken pieces are separated and not crowded. When the bottom of a piece of the chicken turns crunchy and light golden brown, turn it over with a pair of wooden chopsticks. 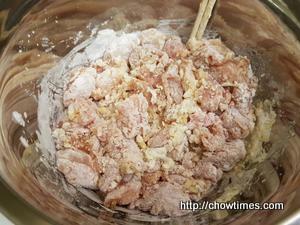 Keep turning the chicken pieces until both sides are golden brown. 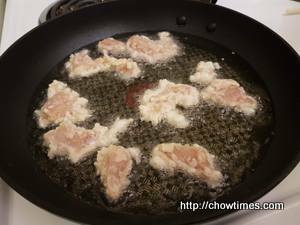 When the chicken pieces are cooked to golden brown, remove them from the frying pan and strain. Repeat until all the chicken pieces are fried. 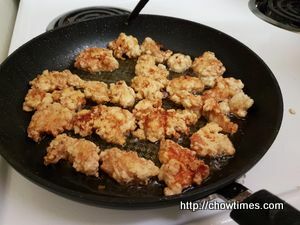 Leave the oil in the frying pan for a second time frying before adding to the sauce to have more crunchy fried chicken. 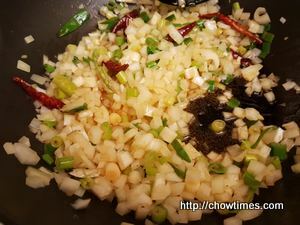 Heat up another frying pan and add the spicy garlic leek infused oil that had been set aside earlier. 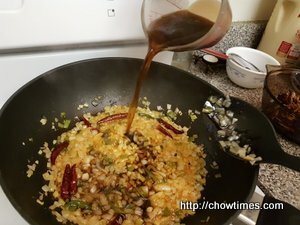 When the oil is heated, add the onion, green onion and dried chili peppers. Stir over medium high heat until the onion starts turning crispy. 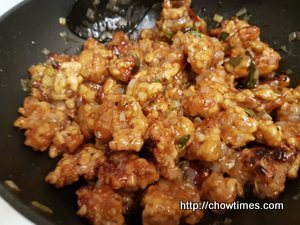 Add the sweet and sour sauce and stir it for about 30 seconds. Turn off the heat. 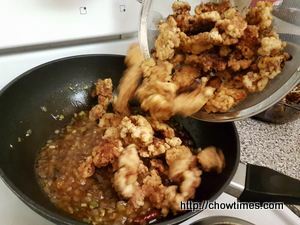 To have a crunchy fried chicken, reheat the oil in the frying pan which you fried the chicken earlier. 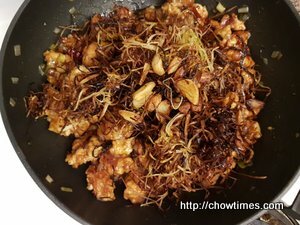 Fry the chicken one more time for about 3 to 5 minutes, turning over with a pair of wooden chopsticks until very crunchy and golden brown. Strain the chicken. Reheat the sauce until it’s sizzling. 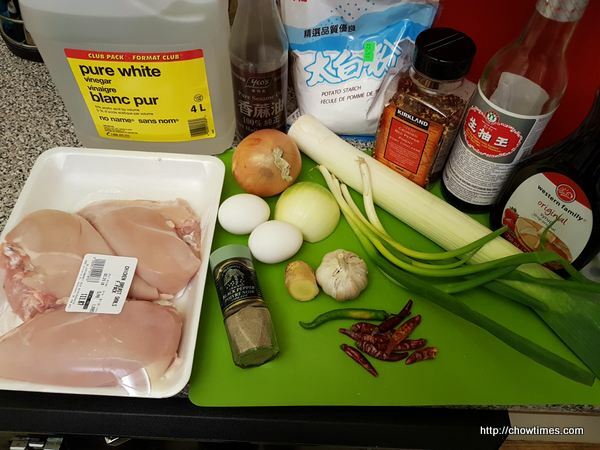 Add the chicken and a few drops of sesame oil. 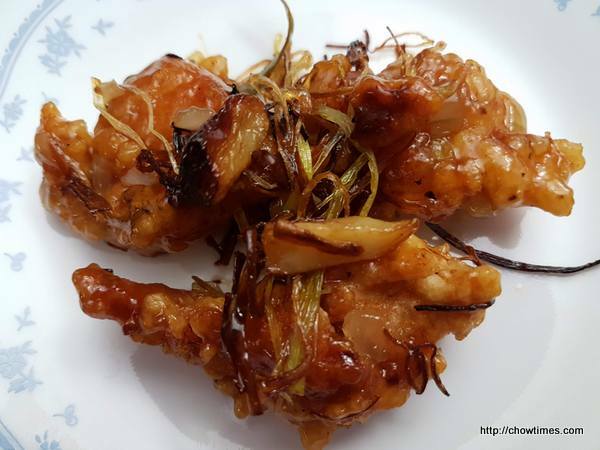 Top with the fried leek and garlic and serve right away.